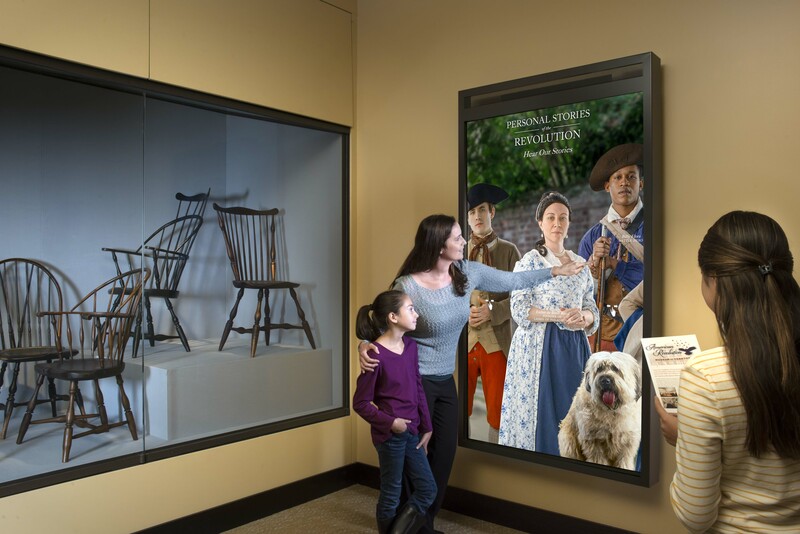 Images should be identified as taking place at the American Revolution Museum at Yorktown and credited, unless otherwise specified, to the “Jamestown-Yorktown Foundation.” See additional images of artifacts on display at the American Revolution Museum at Yorktown in the Jamestown-Yorktown Foundation collection. 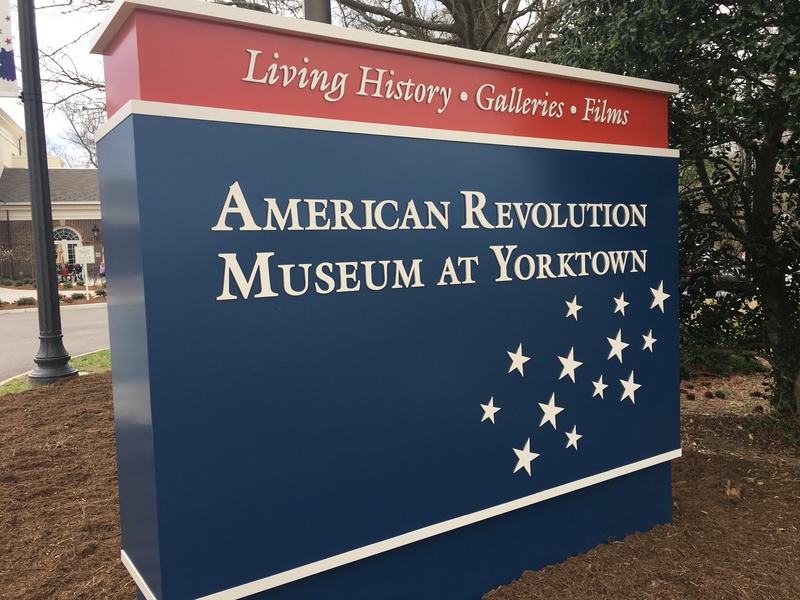 The new American Revolution Museum at Yorktown logo was fully implemented with the name change in October 2016. 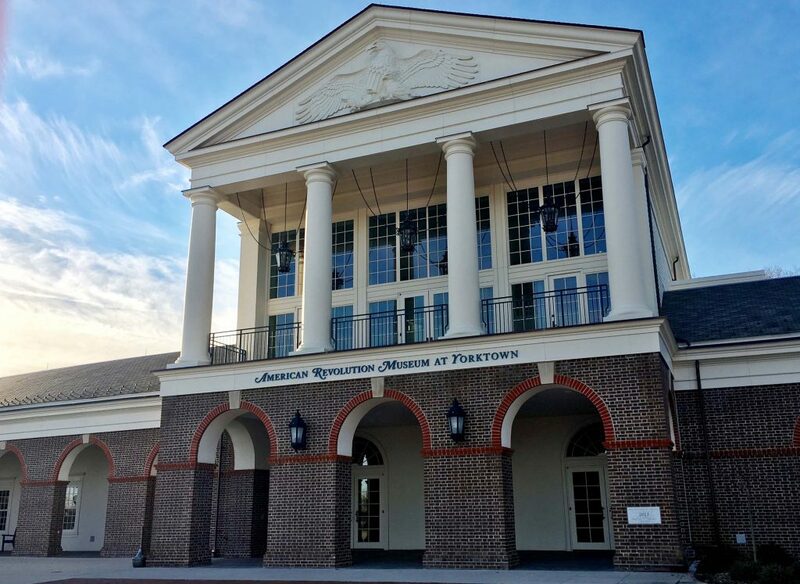 “Freedom’s Sentinel” eagle sculpture dons the pediment above the main entrance of the American Revolution Museum at Yorktown. 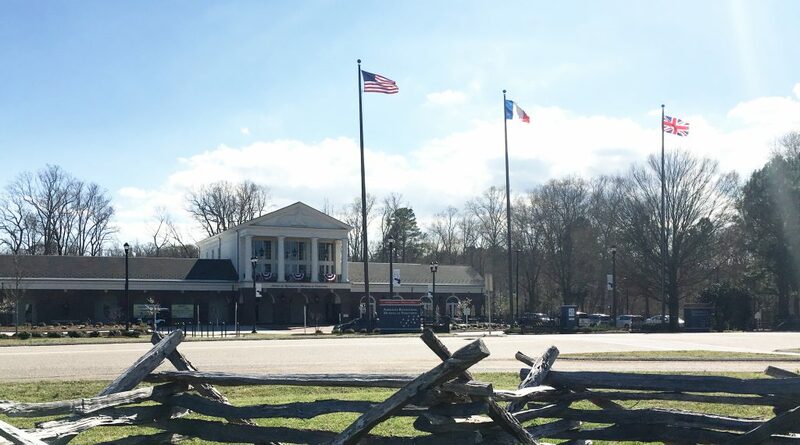 View of the American Revolution Museum at Yorktown from Water Street. A young runner on a Continental Army gun crew waits for his part to win the American Revolution. 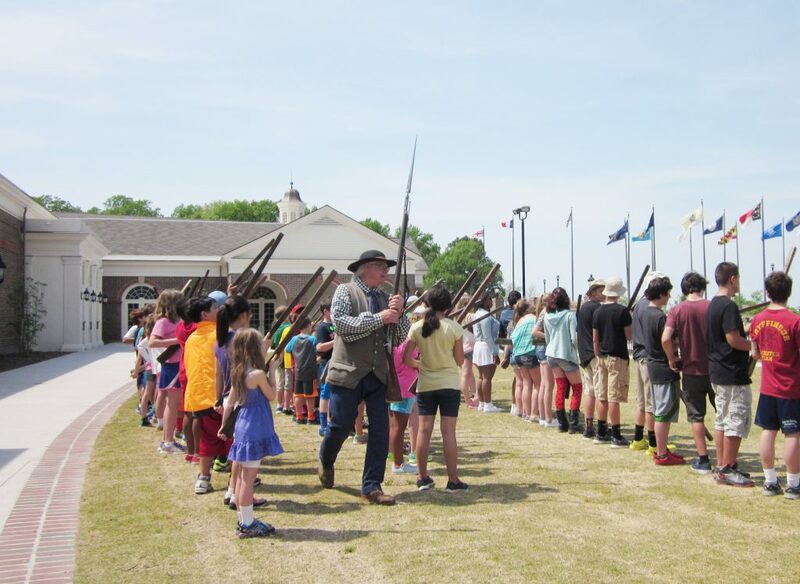 It's one of the fun activities at the American Revolution Museum at Yorktown. 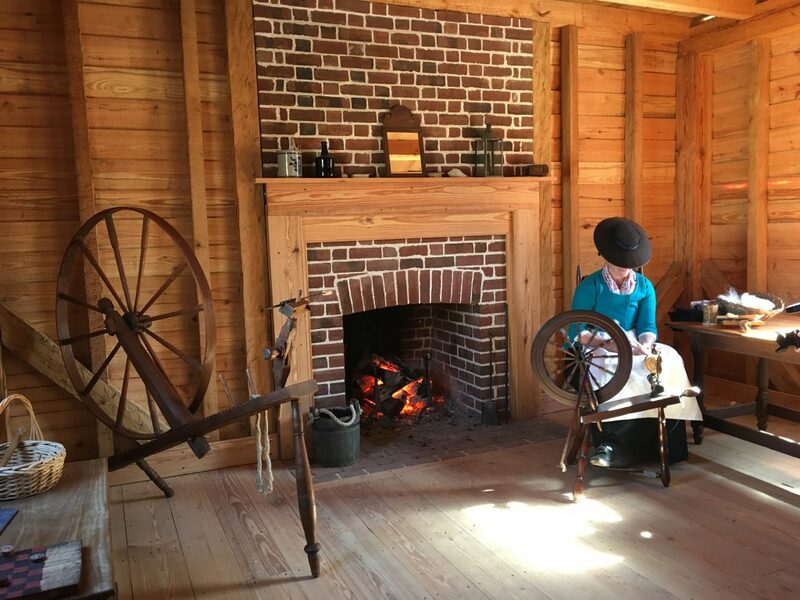 A historical interpreter at the Revolution-era farm spins wool in the farmhouse parlor. The American Revolution Museum at Yorktown features living history, galleries and films. 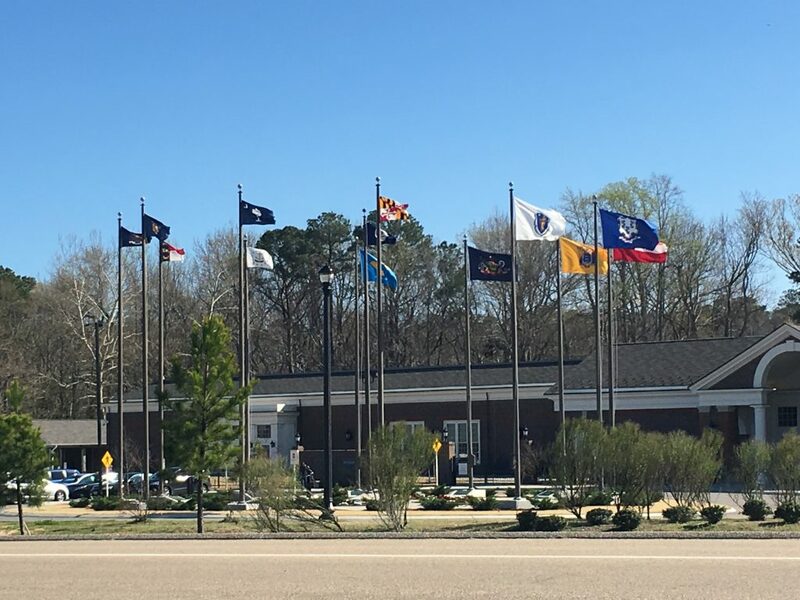 Flags of the 13 original states that ratified the Constitution fly in front of the American Revolution Museum at Yorktown. 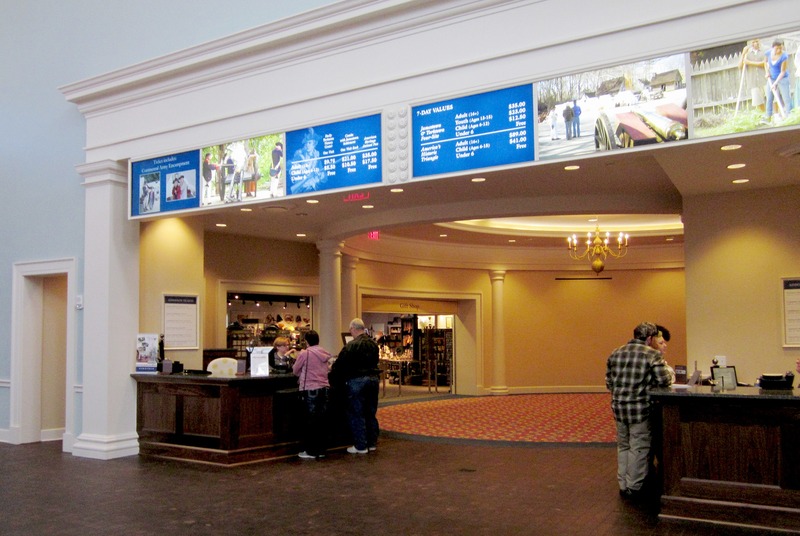 Museum lobby visitor services area, with gift shop in background. 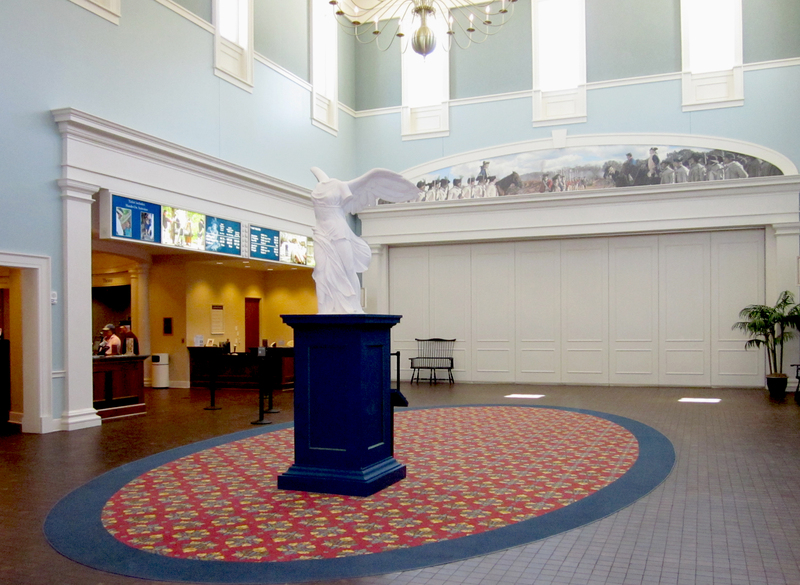 A statue of Nike, Greek goddess of victory, a symbolic expression of the great military victory at Yorktown in 1781, stands in the center of the museum entrance lobby. 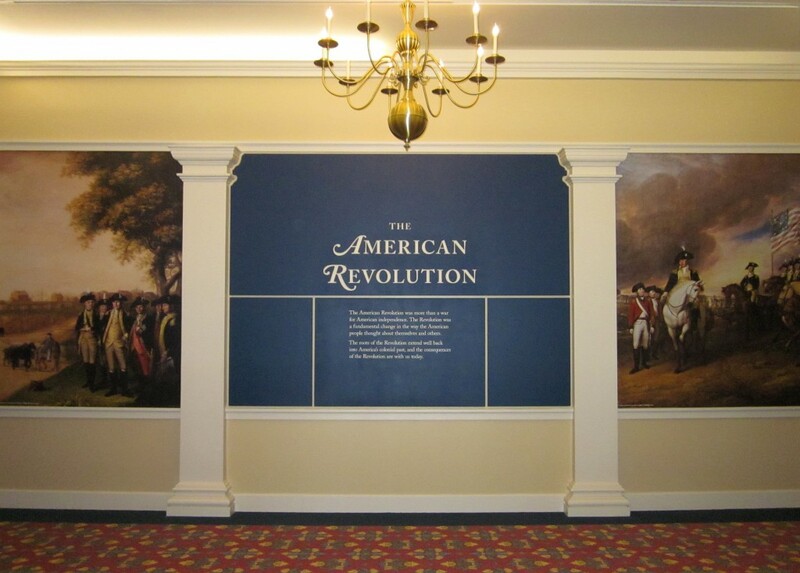 Introductory panel for American Revolution timeline. 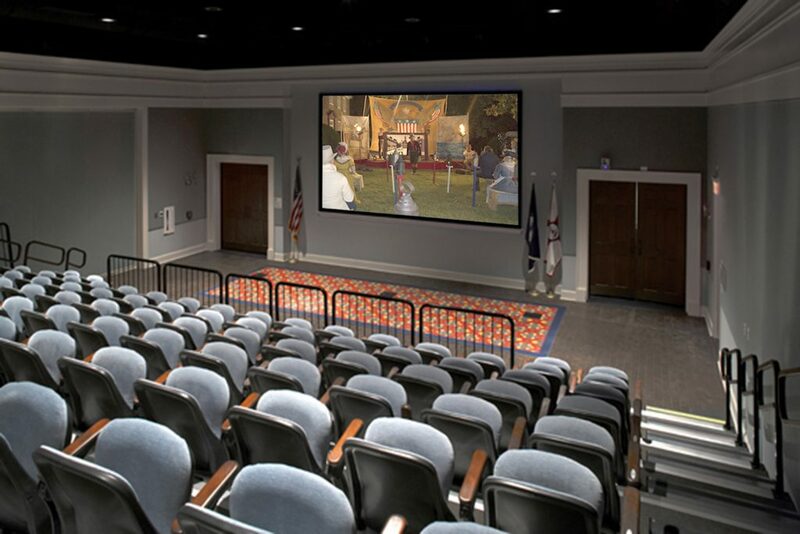 A scene from “Liberty Fever,” the introductory film that debuted in the museum theater October 15, 2016, is superimposed on the screen. Theater photo ©Greg Loflin. 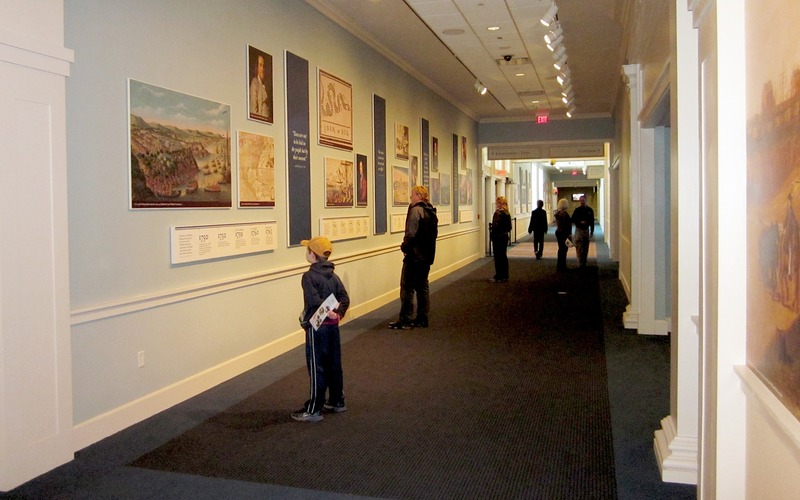 The American Revolution timeline starts with 1750. 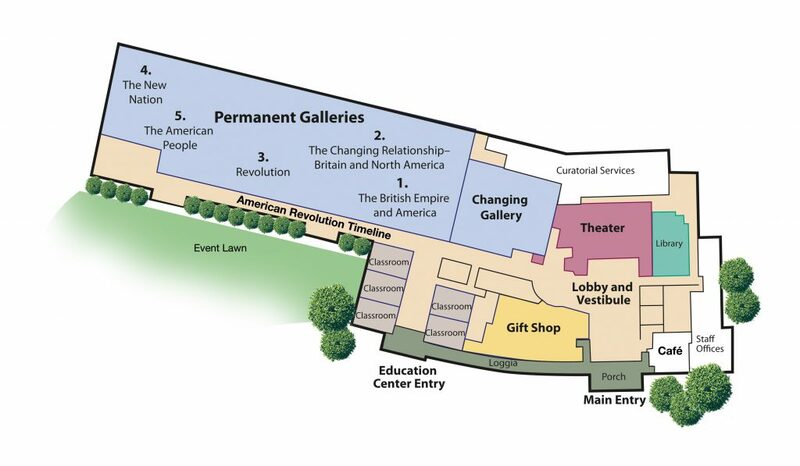 The American Revolution timeline explores the development of the new nation after the end of armed conflict. 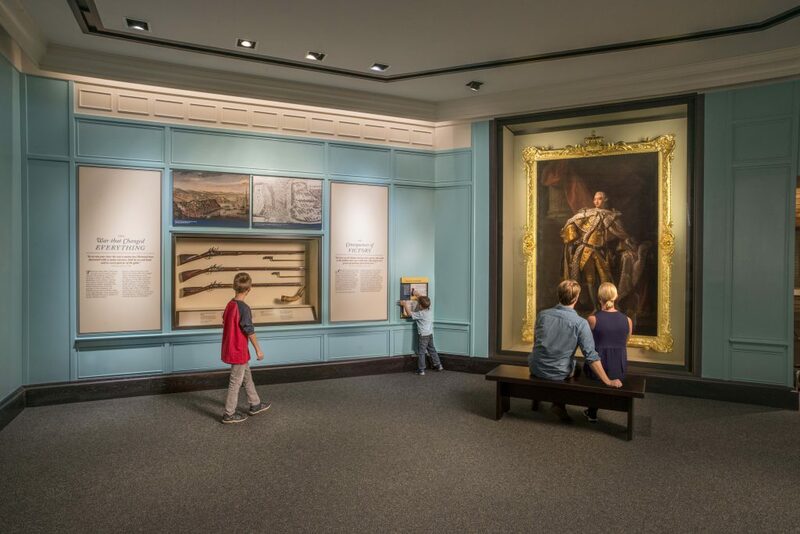 Visitors take in a coronation portrait of King George III, one of the iconic artifacts in the new permanent galleries at the American Revolution Museum at Yorktown. 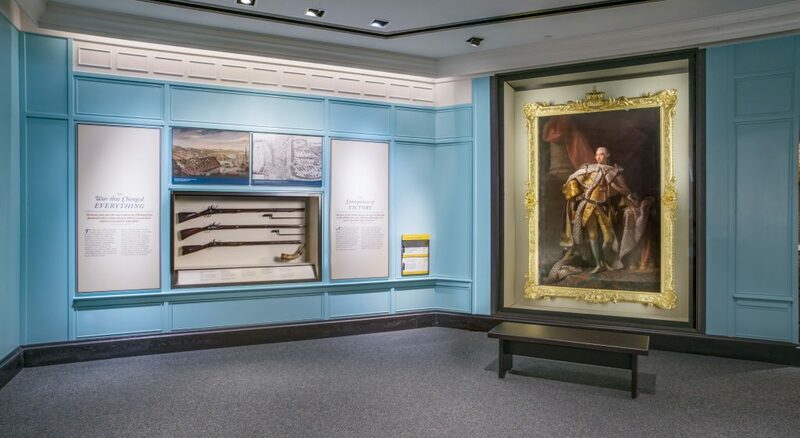 Iconic artifacts, among them a coronation portrait of King George III, have a central role in the new permanent galleries at the American Revolution Museum at Yorktown. 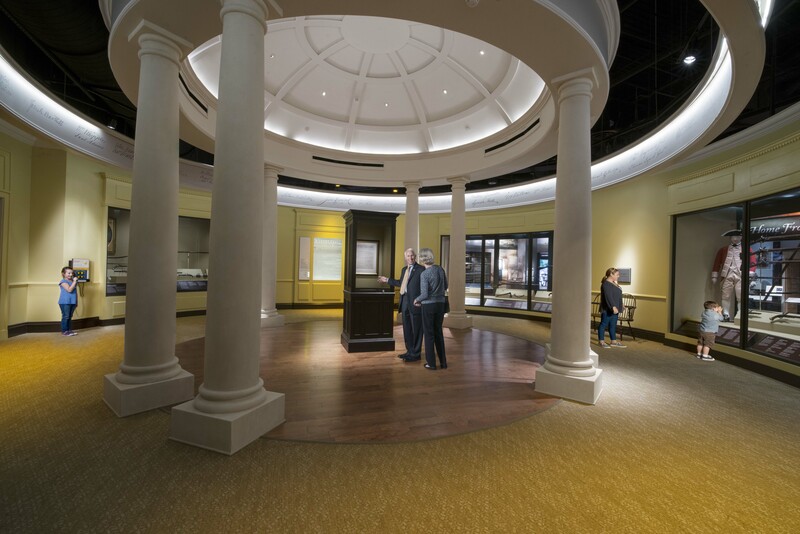 Within a full-scale wharf setting inside the exhibition galleries – including a tavern that serves up a short film – issues of taxation and British economic control are brought into focus. 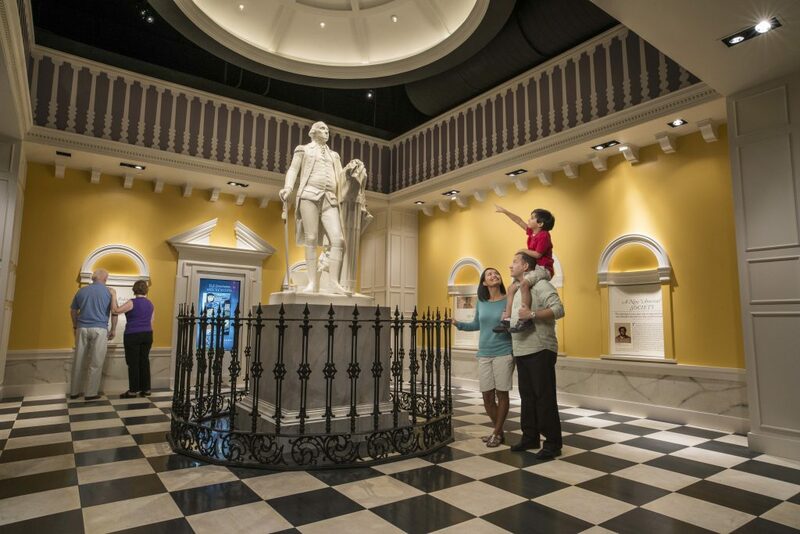 Here, visitors observe a statue depicting Patrick Henry while others take in artifacts of the period. 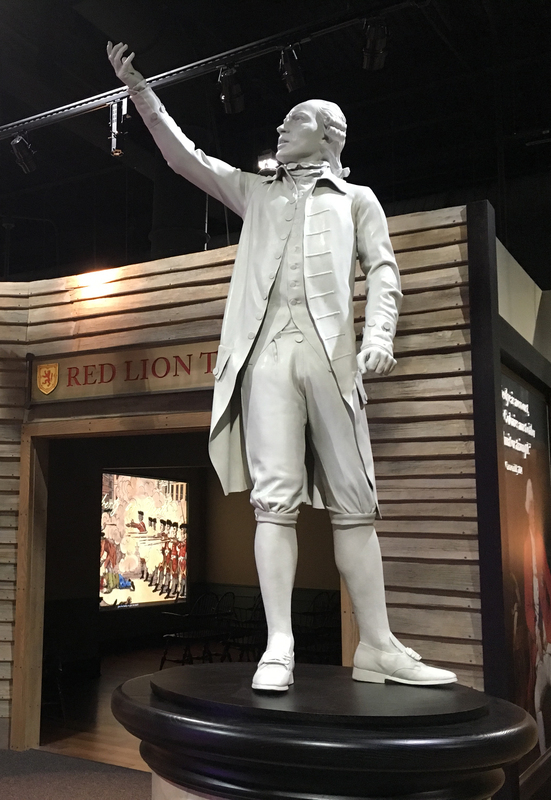 A statue depicting Patrick Henry stands outside the Red Lion Tavern, where a short film traces the evolution in the relationship between American colonists and the British government from the French and Indian War to the outbreak of armed conflict in 1775. 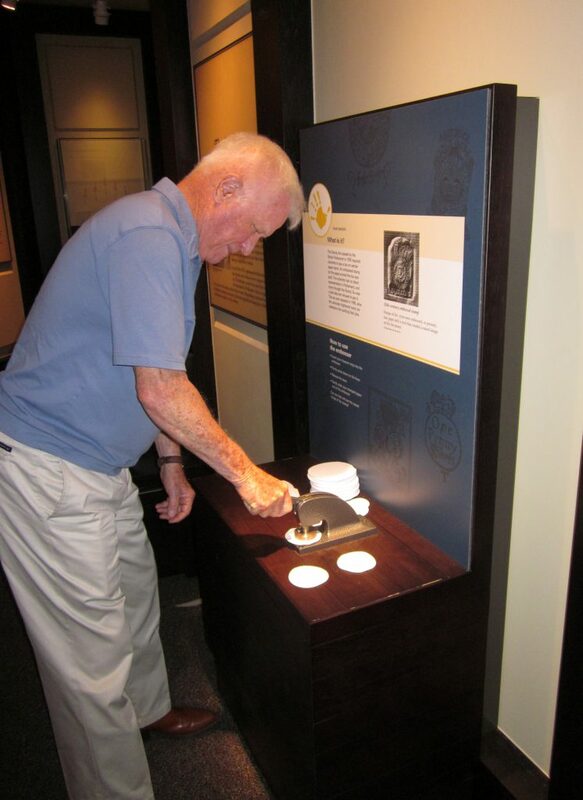 Using a tax stamp embosser, visitors can make an impression in the American Revolution Museum at Yorktown exhibition galleries to show they paid their taxes. 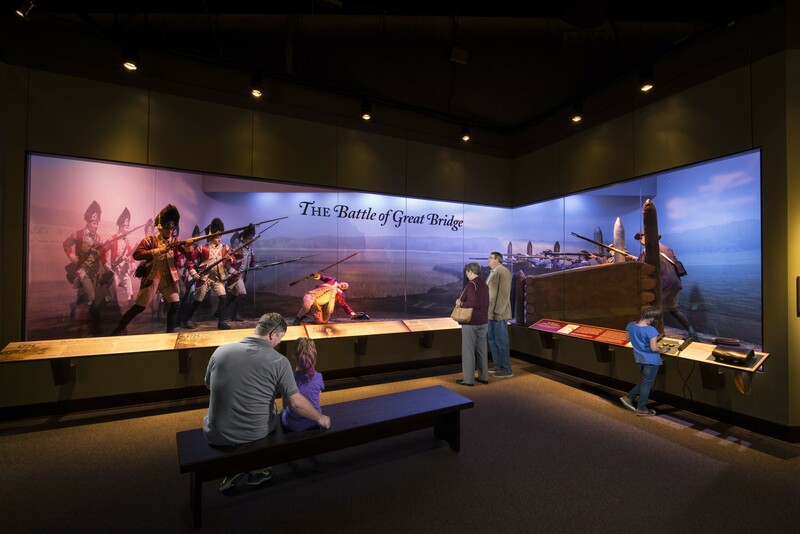 An early American victory, the 1775 Battle of Great Bridge in Virginia, is highlighted in a diorama. 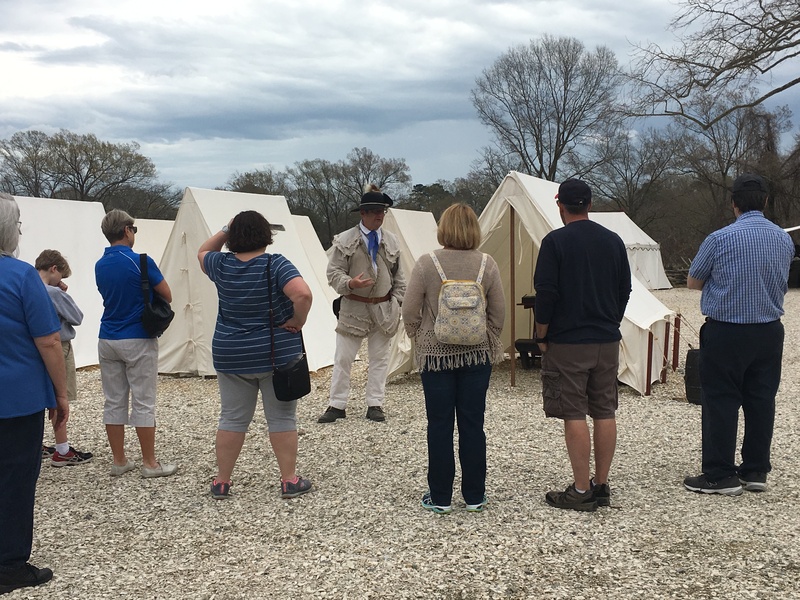 Visitors take in "firing" effects during the battle. 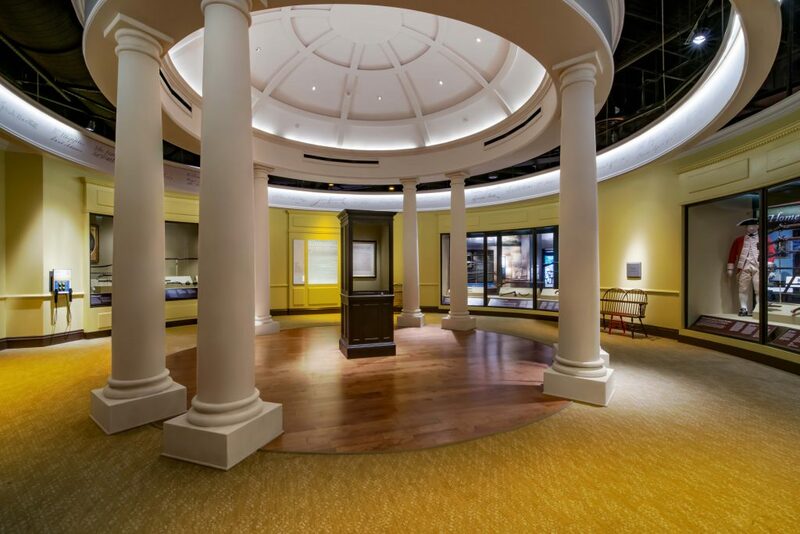 A gallery exhibit highlighting the Declaration of Independence features a rare broadside printing of the document dating to July 1776. 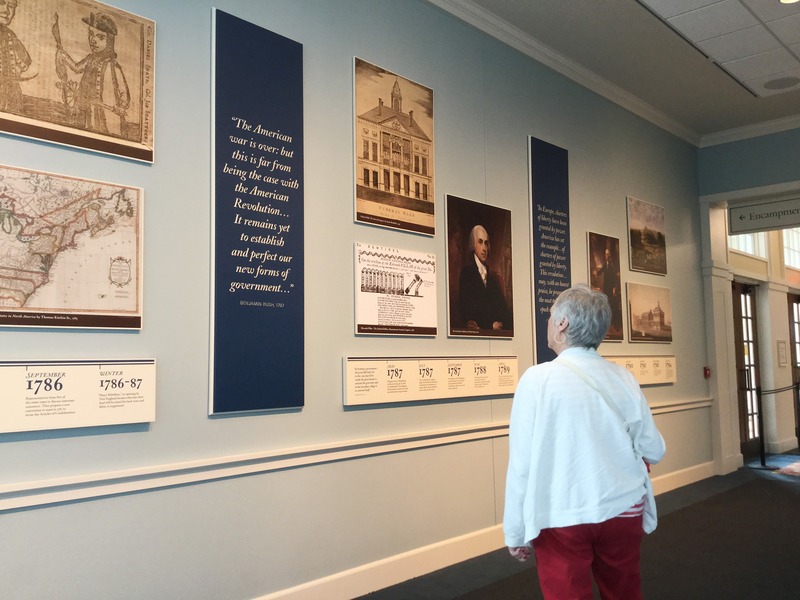 A gallery exhibit highlighting the Declaration of Independence features a rare broadside printing of the document dating to July 1776, surrounded by signatures of those who signed it. 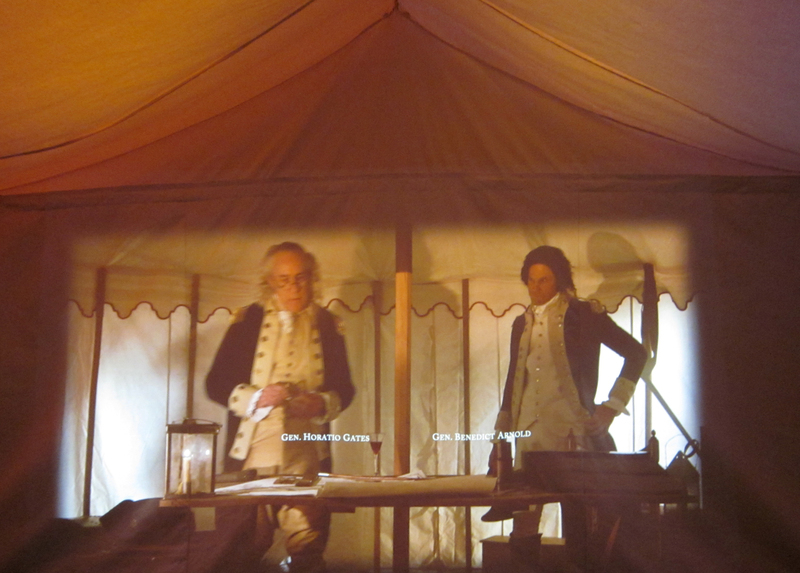 Inside a tent that serves as a theater, “The First Great Victory” gallery film presents the story of the 1777 Battle of Saratoga, a turning point in the Revolution. 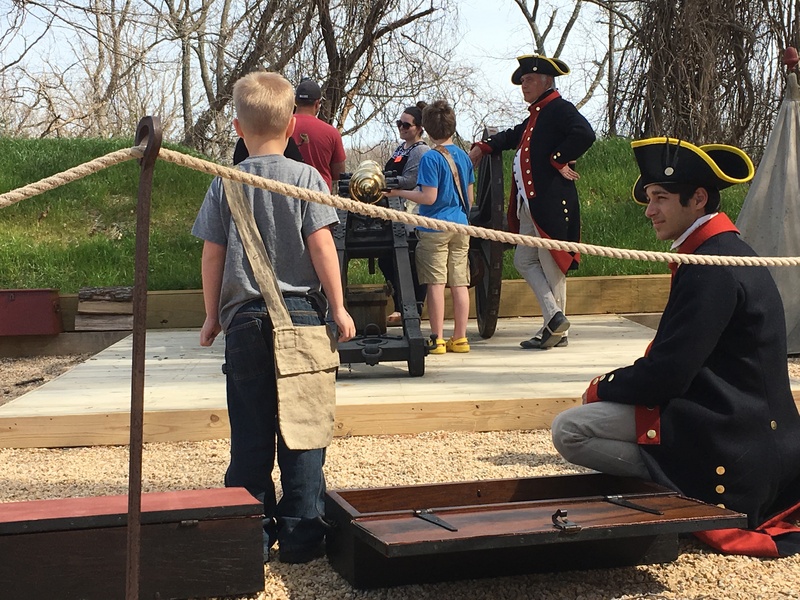 Outside the gallery experiential theater is the reproduction of a 24-pounder French siege gun, representative of the largest guns used during the 1781 Yorktown siege. 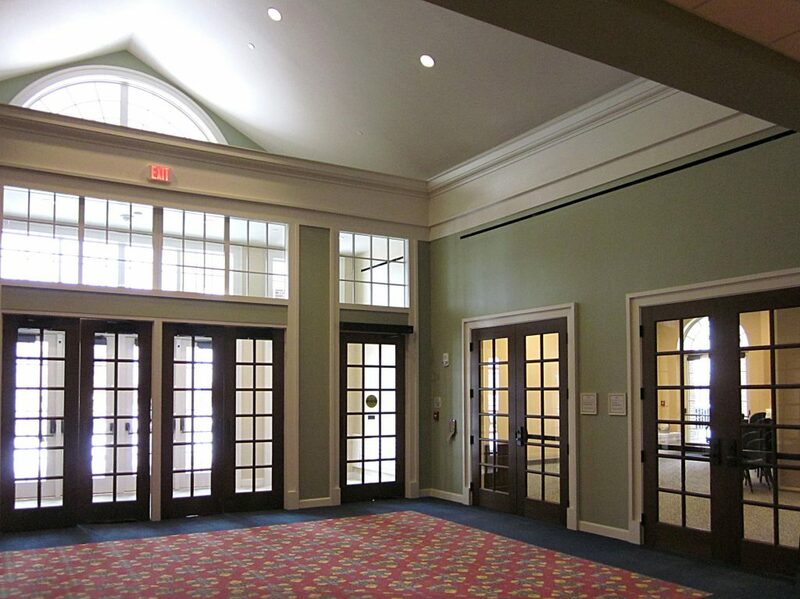 The 10-foot-long tube rests on a carriage created from an 18th-century design. 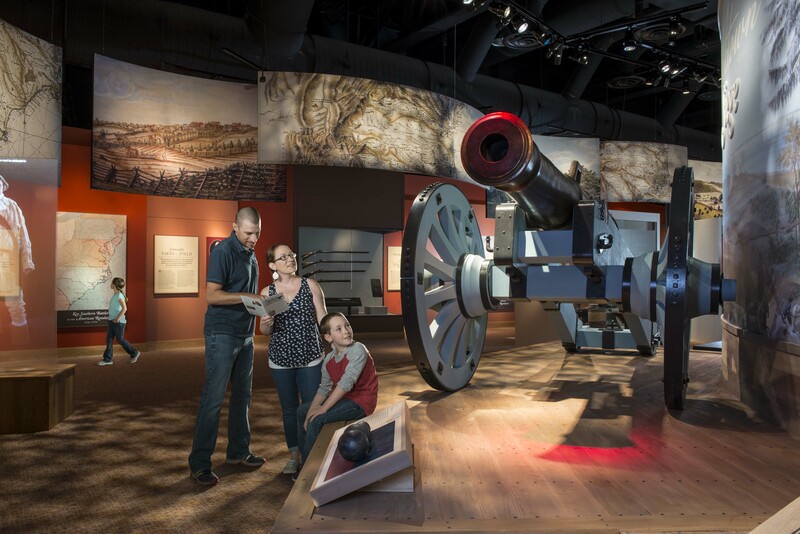 A family observes a reproduction of a 24-pounder French siege gun, representative of the largest guns used during the 1781 Yorktown siege. 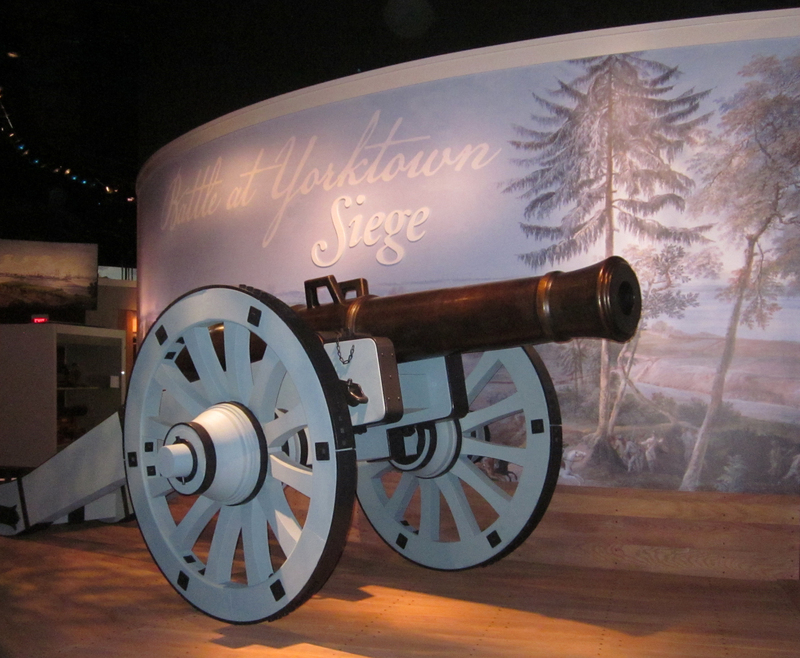 The cannon sits outside "The Siege of Yorktown" experiential theater. 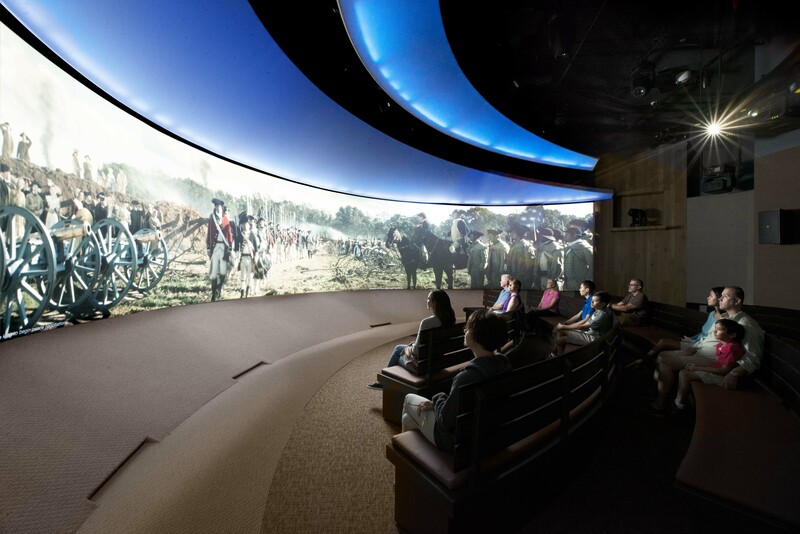 "The Siege of Yorktown" is shown in an experiential theater that transports visitors to the Battle of the Capes and Siege of Yorktown in 1781. The 4D film is shown on an 180-degree screen with special effects. 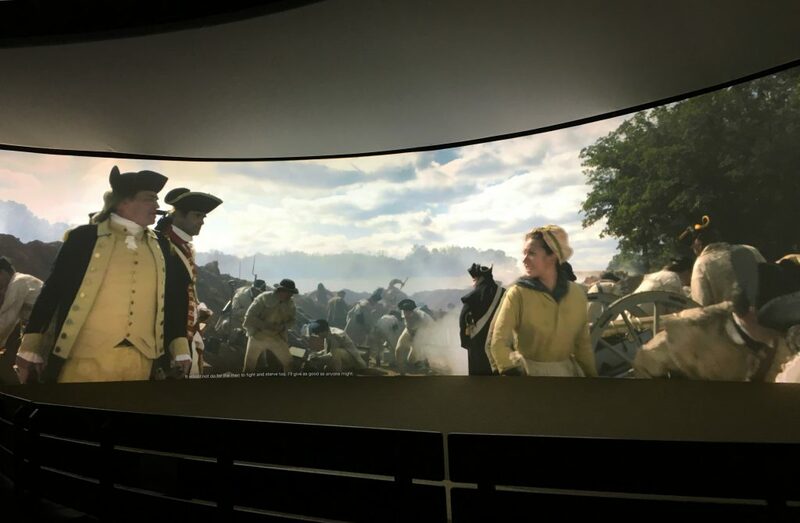 Sarah Osborn, who followed the Continental Army with her husband, is one of the individuals featured in “The Siege of Yorktown,” shown on a 180-degree screen in an experiential theater within the exhibition galleries. "Personal Stories of the Revolution," an interactive exhibit featuring actors in period attire who portray 20 different people of the Revolution, is illustrated with images of artifacts connected to their lives and incorporates a personality quiz. 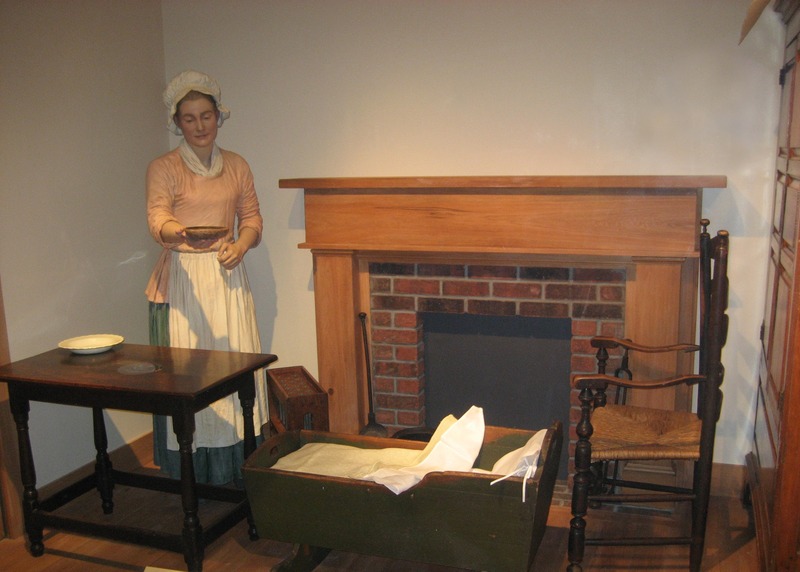 One of three room interiors in a gallery exhibit about life on the home front during the Revolution depicts living quarters for the family of a farmer or craftsman. 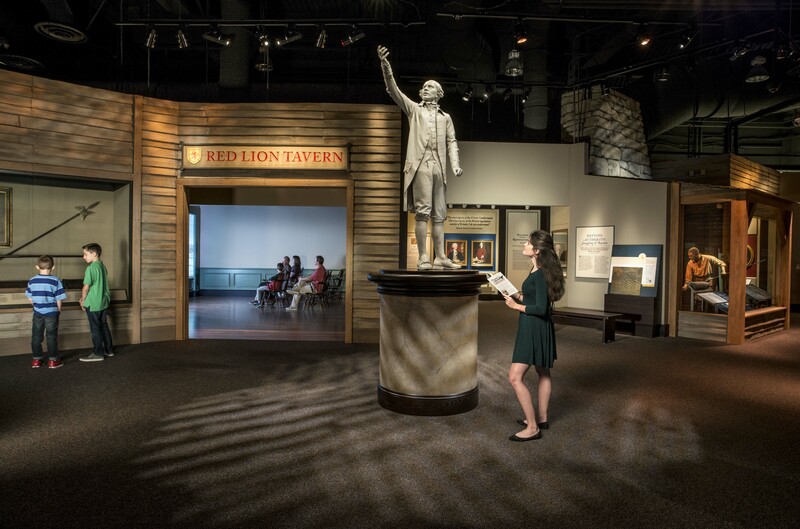 A life-size statue of George Washington that formerly was exhibited at the U.S. Capitol stands in "The New Nation," a section of the exhibition galleries chronicling the development of the United States government. 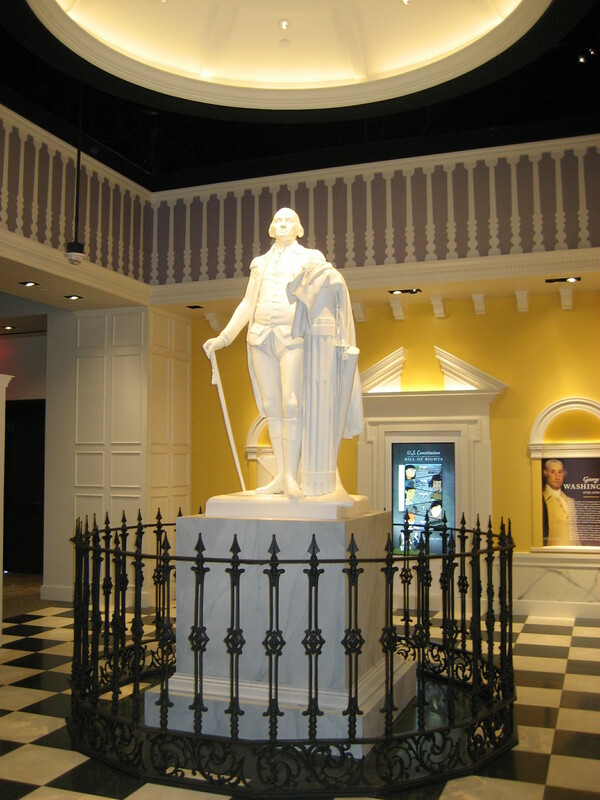 A life-size statue of George Washington that formerly was exhibited at the U.S. Capitol stands in a section of the exhibition galleries chronicling the development of the United States government. 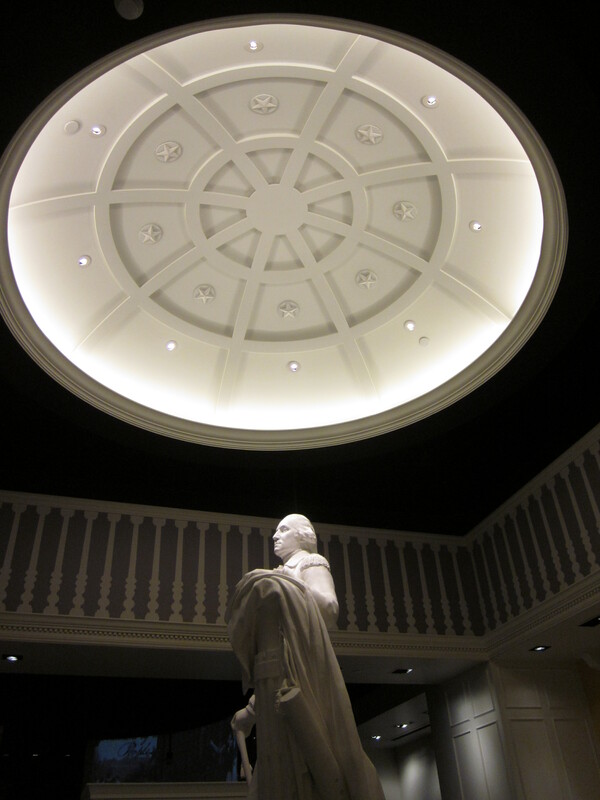 Another view of a life-size statue of George Washington that formerly was exhibited at the U.S. Capitol. A section of the new museum building, with five classrooms, serves as a venue for dynamic, interactive learning experiences for student groups as well as the general public. Wooden-musket drill on the event lawn adjacent to the museum building. 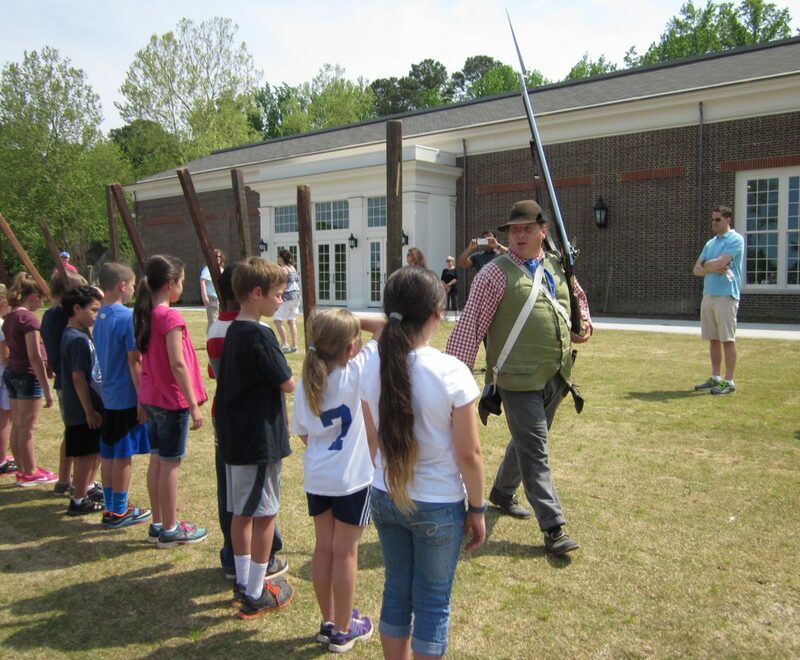 Wooden musket drill at the American Revolution Museum at Yorktown. 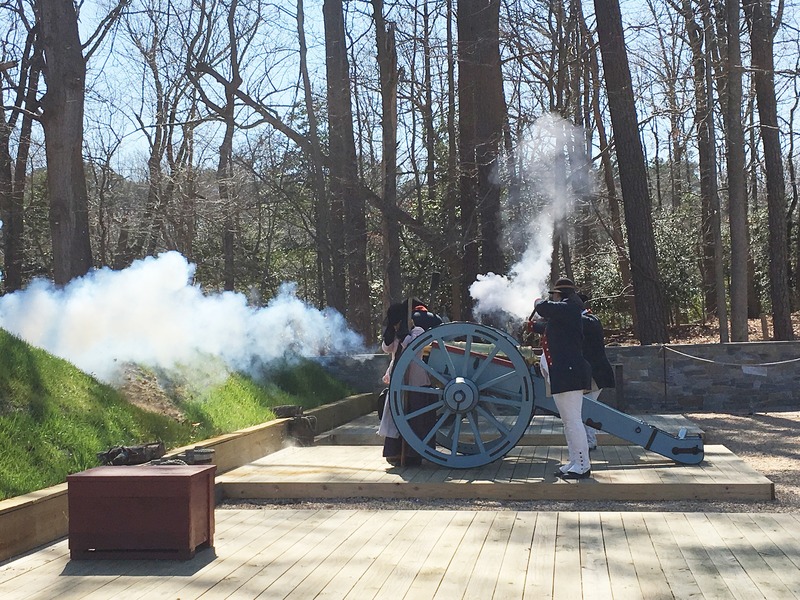 Historical interpreters fire artillery in the Continental Army encampment's artillery amphitheater. 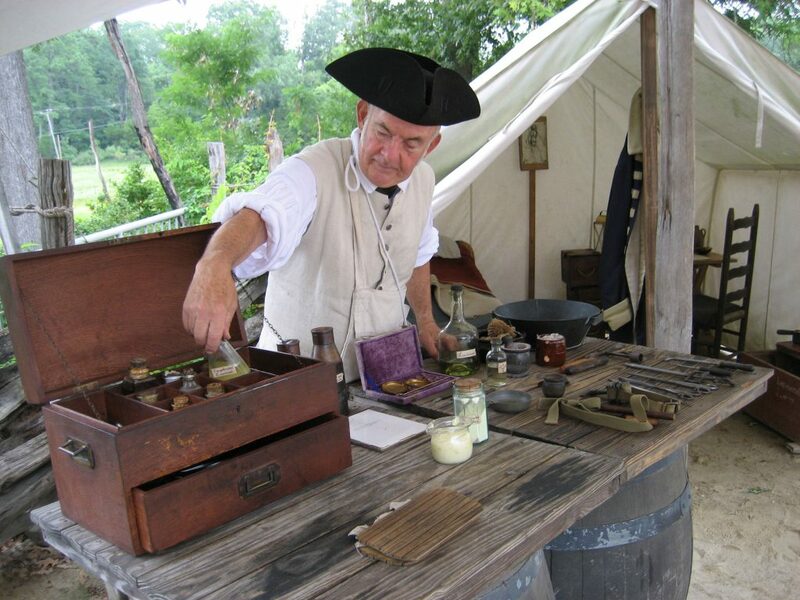 Demonstrations are held daily at 3 p.m.
Young visitors race to the re-created Continental Army encampment to meet a soldier, one of the historical interpreters in the outdoor interpretive areas. 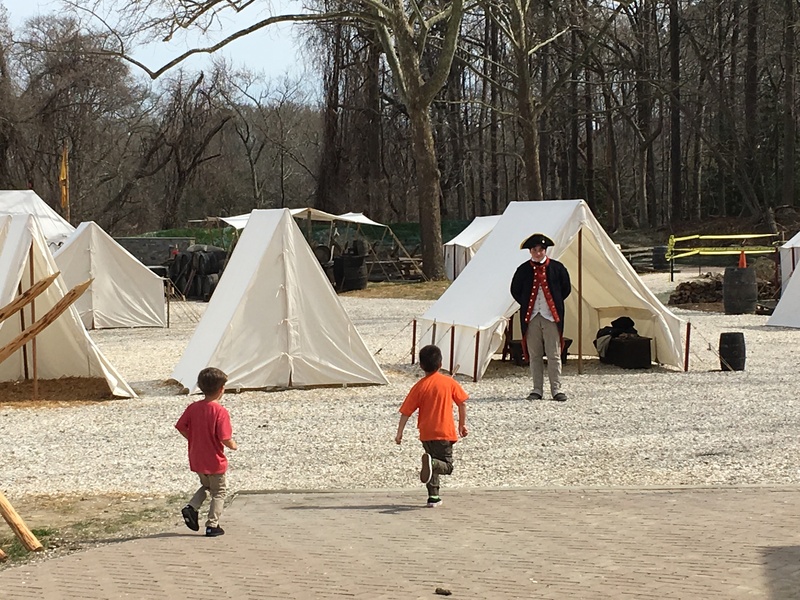 Visitors gather in the American Revolution Museum at Yorktown's re-created Continental Army encampment to learn about the daily life of a soldier. The surgeon's tent at the American Revolution Museum at Yorktown's Continental Army encampment. 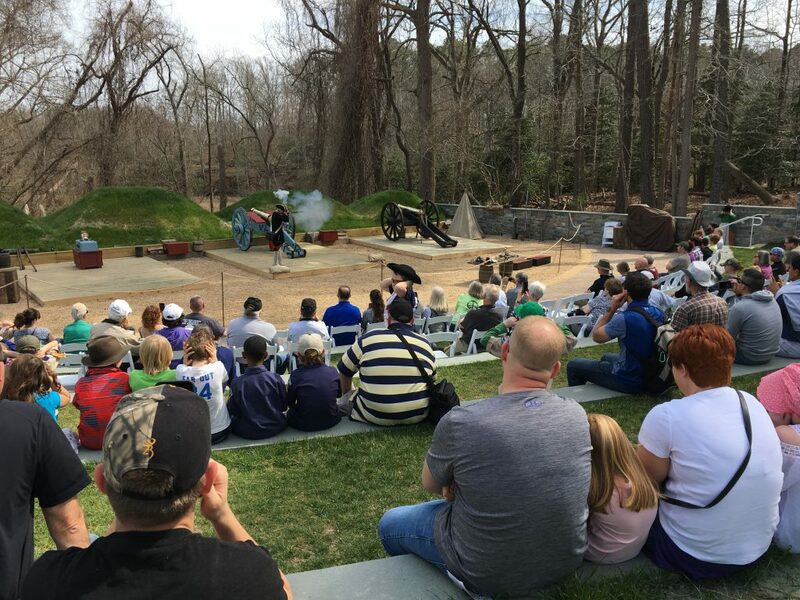 Visitors enjoy a musket-firing demonstration in the Continental Army encampment's artillery amphitheater. 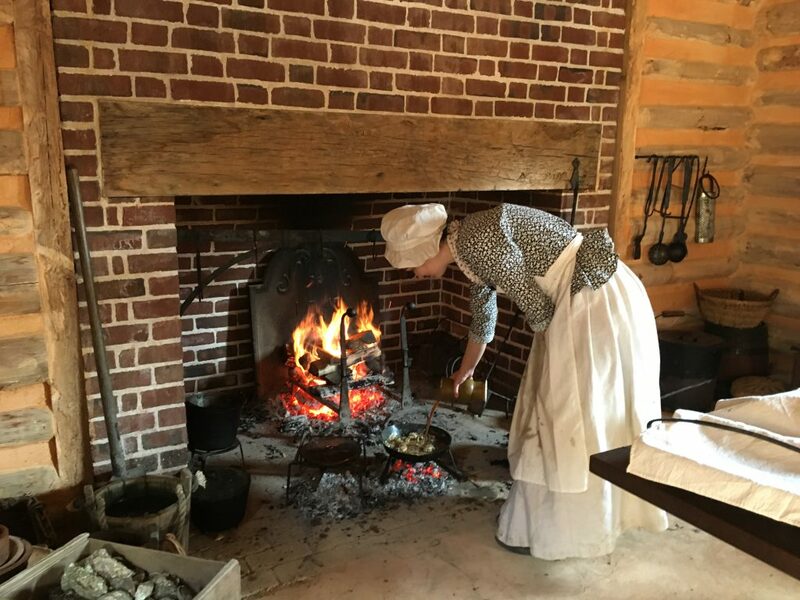 At the Revolution-era farm, a historical interpreter cooks over an open hearth in a separate kitchen. 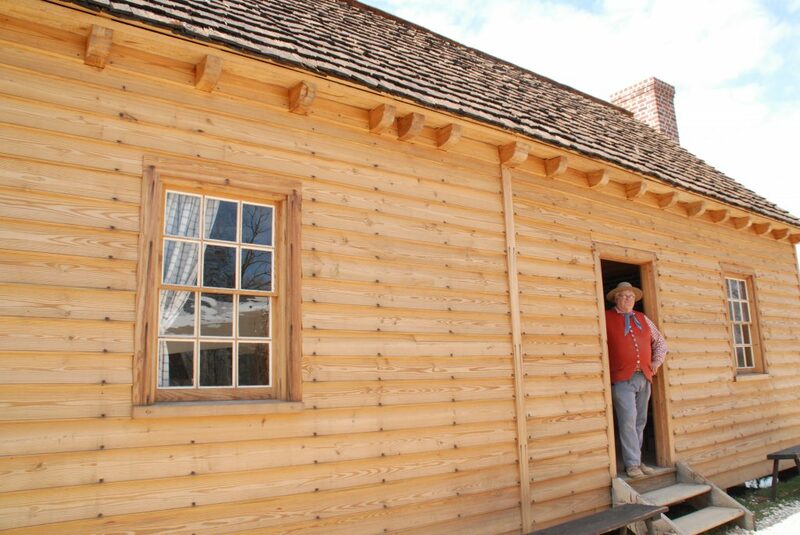 The Revolution-era farmhouse features two chimneys and glass windows. 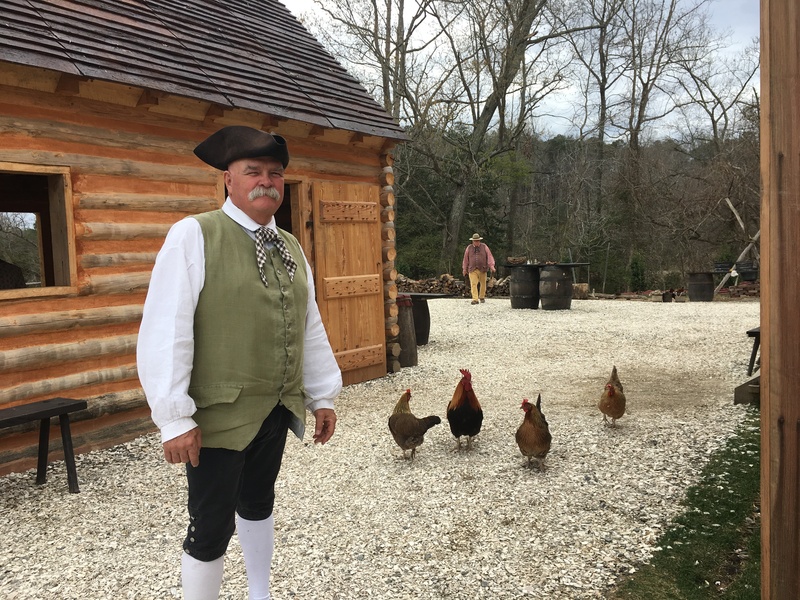 A historical interpreter and his flock welcome visitors to the American Revolution Museum at Yorktown's re-created Revolution-era farm. 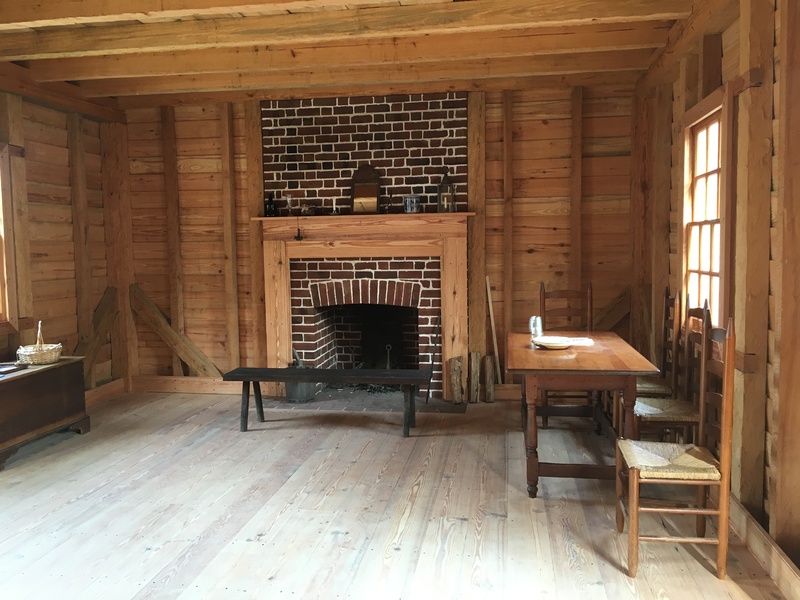 At the American Revolution Museum at Yorktown, the re-created Revolution-era farmhouse features a parlor with tables and chairs. 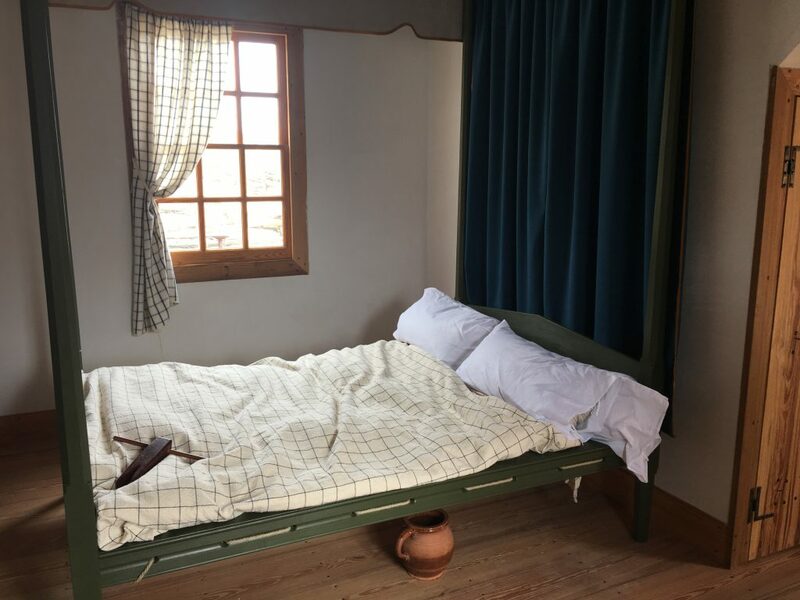 The Revolution-era farmhouse features a room with plaster walls and a canopy bed. 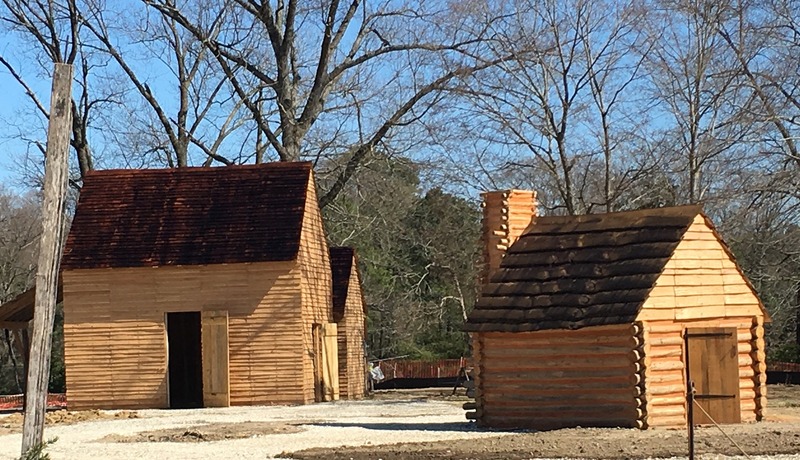 At the American Revolution Museum at Yorktown, the re-created Revolution-era farm features a tobacco barn and quarters for enslaved people. 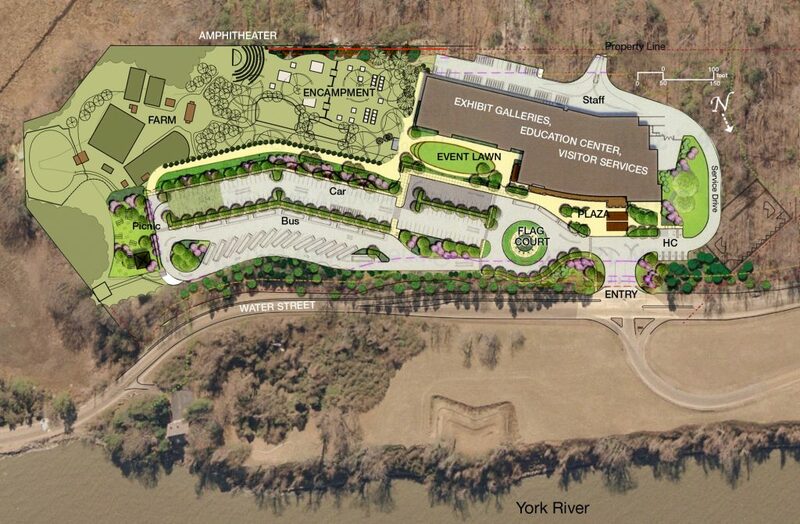 American Revolution Museum at Yorktown site plan.